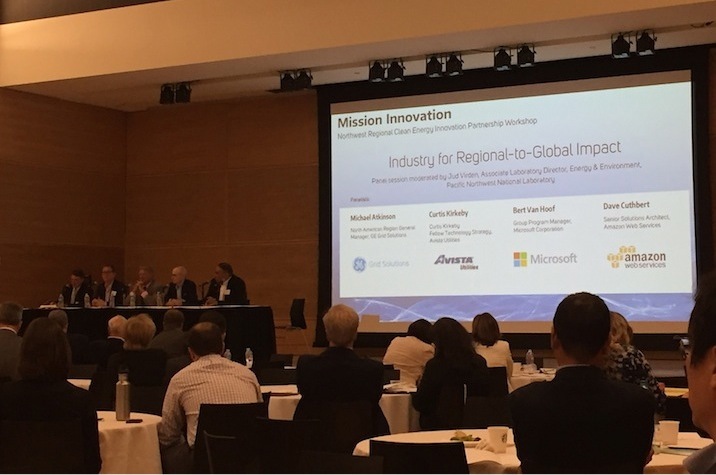 On August 15, 2016, the Clean Energy Institute hosted the Northwest Regional Clean Energy Innovation Partnership (RCEIP) Workshop at the University of Washington. Washington Governor Jay Inslee, Secretary of Energy Ernest J. Moniz, and U.S. Senator Maria Cantwell following their talks at the Northwest Regional Clean Energy Innovation Partnership Workshop on August 15. Clean energy leaders from across the Pacific Northwest gathered with U.S. Secretary of Energy Ernest J. Moniz, Washington Governor Jay Inslee, U.S. Senator Maria Cantwell, and U.S. Representative Derek Kilmer to discuss the region’s challenges and what collective and collaborative actions are necessary to advance clean energy needs. The workshop opened with remarks from University of Washington Provost Gerald Baldasty, Vice Provost for Research Mary Lidstrom, and Clean Energy Institute Director Dan Schwartz. Panelists from from local companies, national labs, and regional organizations led discussions about the opportunities for universities, industries, community stakeholders and the Department of Energy’s national laboratories to leverage emerging clean energy technologies to stimulate regional economic development. 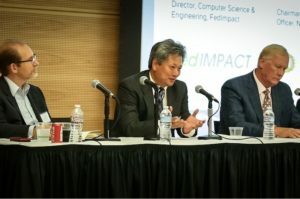 UniEnergy Technologies CEO Gary Yang (center) with “The Innovation Ecosystem – From Research to Startup” panelists Scott Forbes of FedImpact (left) and John Hopkins of NuScale Power (right). Photo credit: Erin Bennett, Orcas Video. 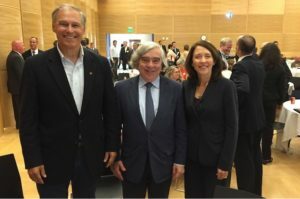 Governor Inslee, Secretary Moniz and Senator Cantwell presented views on the Pacific Northwest’s role as an international leader in developing the technologies to power a growing 21st century clean energy economy. Governor Inslee also took the opportunity to announce $12.6 million in Clean Energy Fund grants to five utilities in Washington. The grants will fund projects proposed by Avista, Seattle City Light, Orcas Power and Light, Snohomish County Public Utility District and Energy Northwest.